Solar power is a relatively simple way to produce energy, but the components and processes are often misunderstood. Here we’ll explain exactly how solar power works. If you’d like to visualize this process, see our solar energy diagram or the how solar power works infographic. So how does solar power work anyway? First, let’s make sure we’re clear about what we’re talking about: When we’re discussing solar power we’re going to generally refer to the conversion of sunlight directly into electricity. This is different from using sunlight to heat water as in solar hot water (see annual energy production of solar hot water system) or concentrated solar power (see concentrated solar power video). Sunlight is converted into electricity by solar panels, which are composed of many solar cells connected in a rectangular panel. The magic of solar energy production occurs within the solar cell, so we’ll spend a few moments discussing them. This process is as complex as you want to make it (further study can be done on the photovoltaic effect, photons, and semiconductors, but we’ll leave that to highly motivated). Solar cells are typically made of crystalline silicon, and despite common perception that new high-efficiency products are about to hit the market, this material hasn’t changed much in the last 10 years. Solar power produced by each solar cell flows out of the solar panel as direct current (DC). Direct current is the unidirectional flow of electricity (think batteries), but since most home appliances operate on alternating current (AC), there has to be a point of conversion. The direct current flows down the installed wiring and into the home, often the garage, where a solar inverter converts DC into AC current. The solar inverter is an expensive and specific (it must match a specific number of panels) piece of equipment. Some solar power systems are now using microinverters, which reduce some of the specificity required by the inverter, but we’ll discuss this in a different post. Once in the home, you’ve got solar power! Most solar systems are grid-tied, which means that they don’t use battery backup systems and only supply power to the home during the daytime. In some areas it’s possible to capitalize on excess power production by sending power back to the grid (spinning the meter backwards). So, how does solar power work? That’s the basic idea, but there’s more to cover if you want to get into the details. 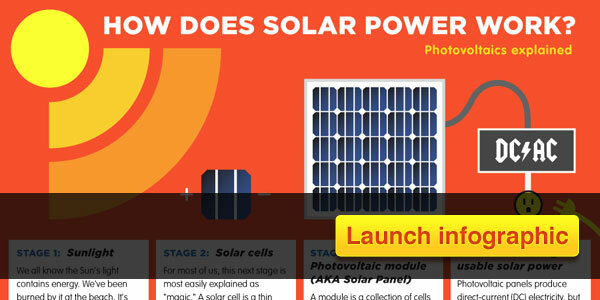 Take a look at the How Solar Power Works Infographic for another visual. One Response on How Does Solar Power Work ? It’s very true, solar panels these days are now easy to assemble. This is due to a wide available of guides as well as the kits for the whole solar panel module. Leave a comment on How Does Solar Power Work ?